How did we get here? Many years ago, I started noticing that urban cycling was no longer a fringe activity. People were starting to see us as early adopters rather than freaks. 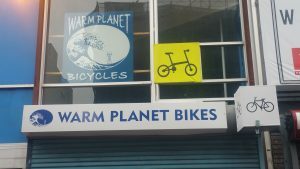 Warm Planet Bikes fills an important niche market in the bicycle business by specializing in folding bikes and electric-assist cargo bikes designed for urban living. The folding bikes are easy to transport and store, so people can use them in a mass-transit commute or day-trip. The cargo bikes make it possible for people to go without a car, thereby reducing their cost of living and raising their quality of life. A “real” bike shop is the one whose primary mission is to get you out on a bike, an appropriate bike for the opportunities in your area. The significant and growing demand for urban bikes justifies the expansion. Also, Warm Planet Bikes current location on the second busiest bike corridor in San Francisco and proximate to a transit hub makes the location a winner for the business. We’re open Tuesday-Friday 8am-7pm, Saturday 11-5. Sunday and Monday by appointment.